As social animals, it’s sometimes hard to avoid making each other sick. Between sneezes, shared food and unwashed hands, it may seem impossible to stop pathogens from bouncing from host to host. We’re not the only species to struggle with this, with animals responses to illness ranging from consideration of their peers to dangerous indifference to spreading disease. On the considerate side of the spectrum, mice seem to do a good job of sequestering themselves when they feel sick. Scientists had previously found that mice are aware of when a peer is sick but wanted to see how the sick mouse itself would react when infected. They injected some mice with lipopolysaccharides, which is enough of a bacterial cell wall to trigger the mouse’s immune response without inducing further illness. They they tracked the faux-infected mice as they moved freely with their usual cohort to see how the individual interacted with the group. 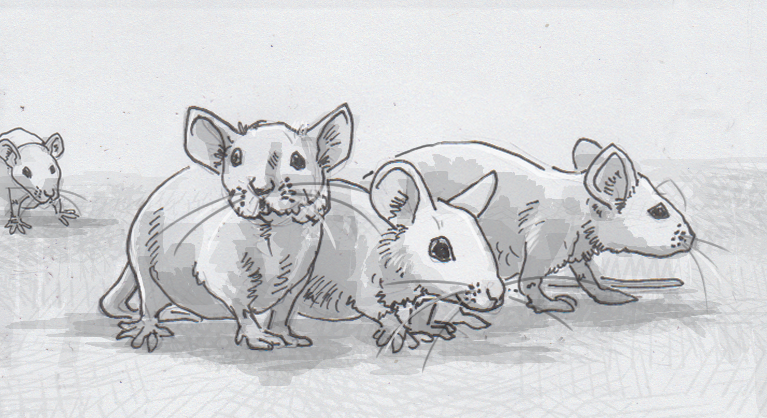 Unexpectedly, the healthy mice didn’t react very strongly to their peer’s symptoms, but they didn’t really have to. The supposedly sick mice actually worked to remove themselves from their groups, keeping a safe distance from others. This behavior pattern probably evolved to help protect relatives in the same gene pool from succumbing to illness as well. While the benefits of this preventative behavior may seem obvious, it’s definitely not the rule across the animal kingdom. We’ve all had an office or school mate who insisted on being at their desk while clearly sick, but it seems that some tadpoles may be even worse offenders, since they’re likely to be spreading viruses that are often fatal to their immediate family. Wood frog tadpoles (Lithobates sylvaticus) were first observed for signs of their personality, usually along the lines of individuals’ risk aversion levels. Bolder tadpoles were noted for quickly moving into new spaces for food, or for how quickly and frequently they approached other tadpoles. Unfortunately for the group of would-be wood frogs, bolder tadpoles carrying the deadly ranavirus showed no signs of slowing down, and would happily come into contact with their peers, kicking off new infections. Unlike the mice with a benign piece of bacteria, the ranavirus carries serious risks, and can even infect humans. If no serious benefits of being a bold tadpole are found, these potential “superspreaders” may be targeted as a way to slow the spread of various diseases.